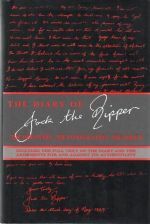 THE DIARY OF JACK THE RIPPER The Discovery, the Investigation, The Debate. Hardback, 1st US edn. Is it genuine? Read the evidence, then judge for yourself. The style of the book is to present James Maybrick as Jack the Ripper. However, Shirley Harrison gives you the facts and the evidence as objectively as possible, so that you can decide for yourself whether Maybrick was indeed guilty of murdering 5 prostitutes during the Autumn of 1888. In three parts : Part One: The Discovery and The Investigation; Part Two: The Diary; Part Three: The Debate. Illus., Maps and Index. 323pp. 8vo. h/back. F. in F. dw. Shirley Harrison was a contributor to the Grey House Books publication 'Who Was Jack the Ripper? A Collection of Present-Day Theories and Observations'. May require additional postage if shipped overseas.